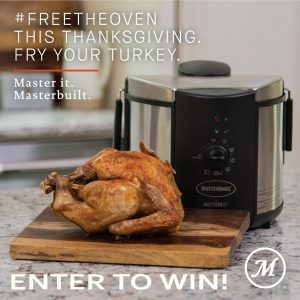 Free the oven this Thanksgiving by frying your turkey in a Butterball Electric Fryer by Masterbuilt. Save your oven space for casseroles and desserts, and have a delicious, deep-fried turkey instead! Listen to WZZK this week and next to win a Butterball Electric Fryer along with a Butterball Turkey, plus a spot in the WZZK turkey races (details on the turkey races coming soon)! Be listening between 4-6 in the afternoon. Caller #14 after Dingo the Redneck Turkey sings a song wins a Butterball Electric Fryer by Masterbuilt, a Free Butterball Turkey, and a spot in the WZZK turkey races!